Early Thursday morning, APC members in the National House of Representatives were prevented from entering the National Assembly complex in Abuja. They were stopped by SSS and police officials from entering the complex after receiving order from President Goodluck Jonathan. Over 1000 soldiers, policemen and State Security Services personnel were deployed to seal the entrance of the National Assembly today. 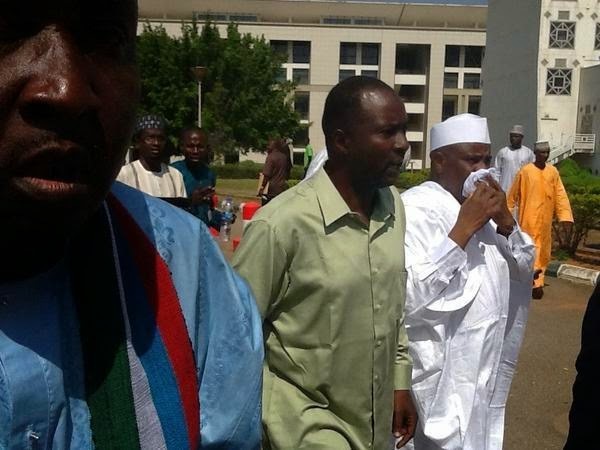 House Speaker Aminu Tambuwal was prevented from entering the building. While he was trying to manoeuvre his way, he was sent back by policemen who allegedly teargassed him. 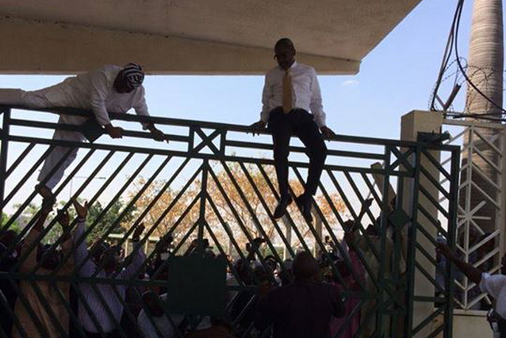 Over 10 APC members had to scale the gates to enter the national assembly to join their PDP colleagues who were freely allowed into the complex. 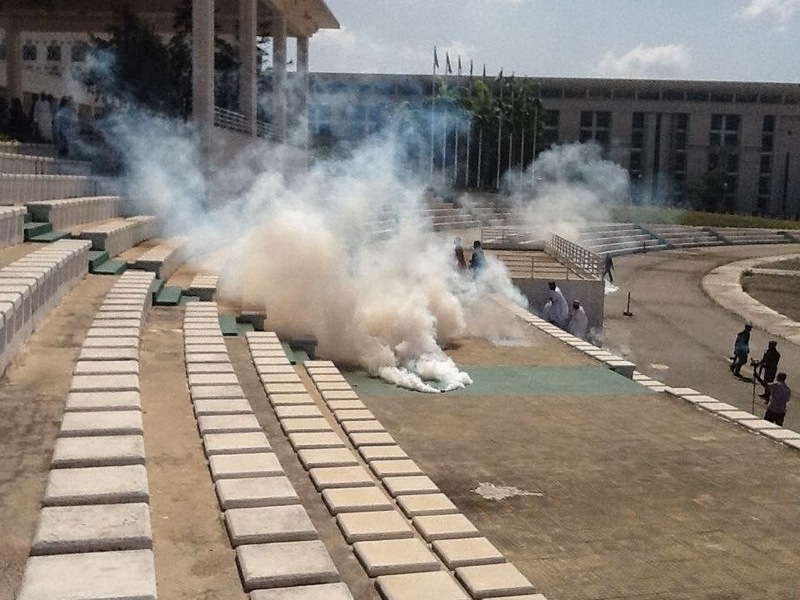 The chaos forced Senate President David Mark to shut down the National Assembly till next Tuesday. 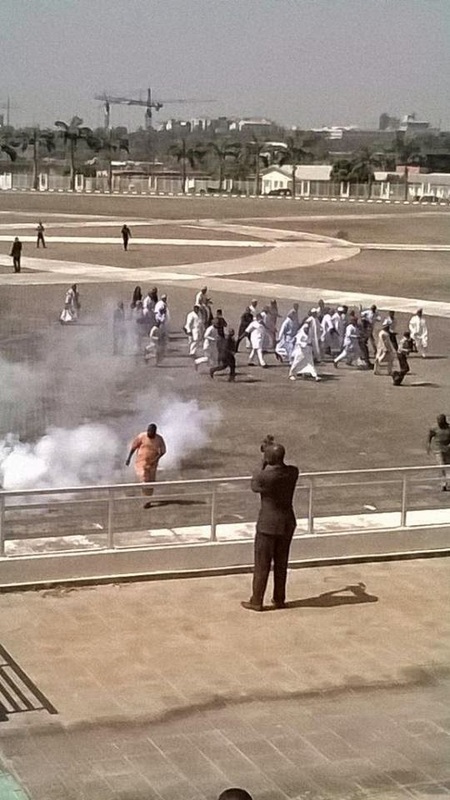 This is coming a day after Goodluck Jonathan led a Peace meeting with PDP members in Abuja. Is this the aftermath of the peace meeting???? It is getting clearer that this country is under the era of dictatorship. When has it become a duty for President Jonathan to always send police to threaten his opponents. Why is it that APC lawmakers were the only ones prevented from entering the National Assembly this morning?? This is a sad day for our nation. The leadership continues to court anarchy by it’s actions, and inaction. It is very unfortunate that Jonathan has resulted to using force to prevent freedom of movement and expression in this country. It is a pity that some people are still supporting the brute force leadership of Jonathan who openly declared yesterday that his destiny is wired with hard luck. Hard luck, blood-sheds, unrest, unemployment and the like is what Nigeria is expressing under his administration and yet he still plan to rule recklessly for another four years. The terror in the north is a few months away fromt he south, east and west. By the time every state experience what my parents wnet thru in Kano, we’ll call for help from developed countries. Let Jonathan continue ruling, his case will end up a disaster. PDP under President bad luck,send over 1000 Military to send out is opponents party APC out of National Assembly,this is Dictatorship,foolish Military coomon Boko Harm u can fight for 5 yrs with ur oga on top PDP.U run away like women or sheep without owner,but send to APC people u can show up,Boko Harms will get u and ur leaders out of ruleing very soon,fire on the mountian. not 2 responses u naijagists dont print my own,pdp members too,na wa. It is so horrendous to see this in a republic. Apc is worst than pdp. it’s only God that wil save nigeria. I don’t see any reason why people cannot be objective. commenting blindly and accusing one party does not make sense at all. let us admit that we have a problem, trace the root cause, and then look for solution. As far as I am concerned, both PDP and APC are same kind of people with no human heart. either PDP or APC. The common man will still suffer. My God will judge all of you. val, your comment is i***tic. it’s like saying don’t blame Hitler for the second world war. the man called goodluck ebele jonathan has shown his gross incapability to rule this country if he can humiliates nigerians in such a way.he will not continue insha allahu.